It takes time and effort to achieve a poodle's attractive coat. As impressive as poodles' curly, endlessly fashionable coats are, they must receive a lot of grooming and maintenance to keep them healthy, clean and attractive. Daily grooming lets your poodle puppy learn early about an activity that will be a life-long routine, making his trips to the professional groomer easier. Pick up your poodle pup regularly so he gets used to being handled. Hold him on your lap, and touch him all over. Grooming is a great way to bond with your dog, but he first must be comfortable with your touch. Verbally praise your little buddy, and give him a food treat when he remains passive and calm. This teaches him that sitting still when he's being handled has a positive outcome. 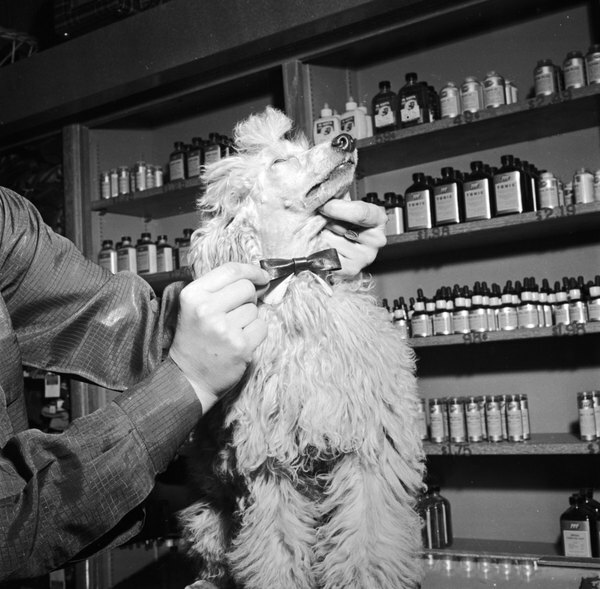 Hold your grooming tools so your young poodle can sniff them. Don’t start grooming him, but allow him to build positive associations with the tools. Reward him when he interacts with them. Clasp the fur in your weaker hand. Gently brush out any dirt, mats or knots, using a slicker brush. Start at the hair tips, and work your way to the base, always brushing away from the body. Grasp the fur in your fingers in a way that prevents the brush from pulling on the puppy's skin as it moves through tangles or mats. If your baby poodle feels pain when he's brushed, he's not going to be eager to do it again. Your job is to teach him that brushing is enjoyable. Give your poodle puppy a quick brushing every other day to prevent his coat from becoming dirty or matted. Stand your poodle puppy in the bath, shower, or in the yard, if the weather permits. Check that the water is warm and comfortable, but not hot, before you wet your little pal's coat. Wet the fur, either by pouring the water from a jug, or with a shower or hose attachment on the bathtub faucet. Start at the back and finish with the head. Massage the shampoo in, and rinse thoroughly. Towel dry and comb the fur simultaneously for a fuller, fluffier finish. Take your baby poodle to a professional groomer for his first coat clipping and nail cutting, unless you are highly experienced at performing these tasks. Inexpertly done, both of these tasks can cause pain and fear to your puppy, leaving him not wanting a repeat of the experience. Good first experiences and early socialization are crucial to your pup's upbringing. Start your puppy's professional grooming experiences as early in life as possible, but not before he has had his puppy immunizations. Find an experienced groomer known for handling puppies well. Put a small amount of dog toothpaste on the tip of your finger and let your puppy sniff it. If he licks it off, that's fine. Do this once a day for a week. Wrap a small piece of gauze around the tip of your finger, and apply toothpaste. Slip your finger into the puppy's mouth, crook your finger so the tip is at a 45 degree angle to his tooth, and brush each tooth using a circular motion. Verbally praise your puppy once you've finished the brushing. Give puppy a chew toy every day. The abrasion of the toy against the teeth removes calculus and debris. Repeat the brushing process once or twice a week. Smell his breath before you start. 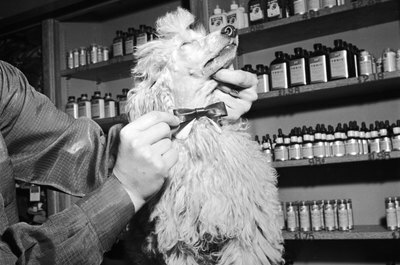 It's never going to be a enchanting scent, but refer any strong, unusual or foul odors to your veterinarian for further investigation. Look out for signs of crowded or crooked teeth. Small dogs, especially toy breeds, have small jaws, but the same number of teeth as large breeds, a factor that can lead to crowding of the teeth. By around 6 months, the baby teeth should have been replaced by the permanent set, but overcrowded teeth may cause problems. If any deciduous teeth don't want to come out, take your pal to the vet. Dog Health Dog: Are Some Dogs More Likely To Have Dental Problems? How Big Can a Shih Tzu Poodle Puppy Get?